Scientific research shows that the most successful negotiators analyze the situation thoroughly, self-monitor wisely, are keenly aware of interpersonal processes during the negotiation – and, crucially, enter negotiations with a fair and cooperative attitude. This book is a clear and compact guide on how to succeed by means of such goal-oriented negotiation and cooperative persuasion. Readers learn models to understand and describe what takes place during negotiations, while numerous figures, charts, and checklists clearly summarize effective strategies for analyzing context, processes, competencies, and the impact of our own behavior. Real-life case examples vividly illustrate the specific measures individuals and teams can take to systematically improve their powers of persuasion and bargaining strength. The book also describes a modern approach to raising negotiation competencies as part of personnel development, making it suitable for use in training courses as well as for anyone who wants to be a more persuasive and successful negotiator. "The author shows compactly different models of negotiation and effective communication and builds the bridges to practice. Helpful checklists make the book valuable." "In his new book, Marco Behrmann provides a concise and practical introduction to the topic of negotiation, primarily within the context of the corporate world. This well-organized book, complete with helpful headings, subheadings, and marginal descriptors, differentiates negotiation from related persuasive processes such as mediation and arbitration and compares several models of negotiation and effective communication. One of the chief strengths of the book is its interdisciplinary approach. Wisely, Behrmann reminds the reader that different negotiation types and contexts will benefit from different sets of skills and personality traits. The thoughtful, concrete details of the appendices make them stand out as possessing great value. [They] contain specific suggestions on effectively phrasing and timing negotiation statements intended to address objections, as well as helpful tips on preparing for, conducting, and following up on a negotiation. One even offers useful tips on how to protect oneself against tricks, unfair tactics, and difficult opponents." 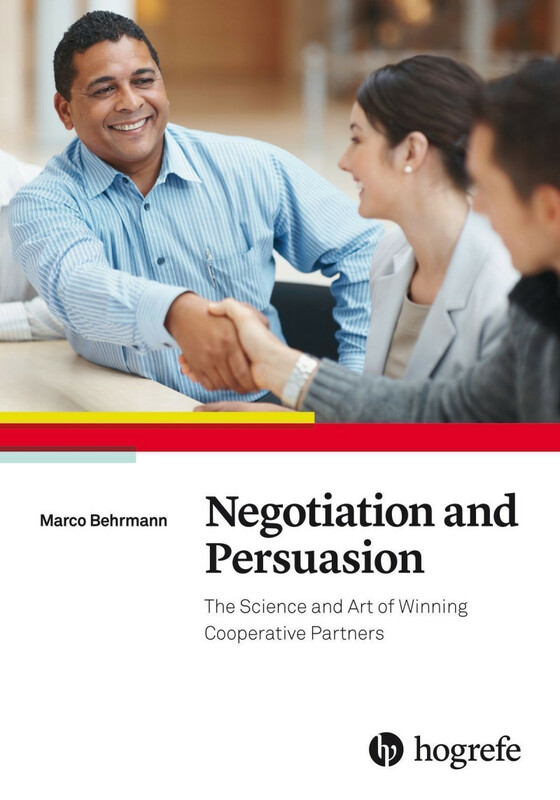 "Marco Behrmann’s book is a concise overview of research on negotiation competence. It gives insights into a new approach that focuses on the interaction of trait, competence, and situational setting. It is a neat example of using scientific findings to underline and focus training and development in business settings." "Marco Behrmann has collated scientific knowledge on negotiation and persuasion for use in organizational practice. Presented in a concise and even entertaining style, this book succeeds in demonstrating how to negotiate successfully and fairly at the same time. A clear recommendation." "Marco Behrmann has written an excellent guide for both individual negotiators and those who manage negotiations for large organizations. He provides not only practical advice but also the theory and concepts behind the negotiation process. He includes excellent, real-world case studies and helpful tools and checklists. This will be the “go-to” book for novices and experienced negotiators alike." "This book successfully bridges theory and practice on negotiation and persuasion, and thus constitutes a long-needed resource. The core principles are explained in an easy-to-read and engaging style and are exemplified with case studies. This is an eye-opening read for all those who negotiate and ideal for students and practitioners alike." "Dr. Behrmann does an outstanding job of presenting the theoretical models and research findings in the fields of negotiation and persuasion in a clear and concise format, and in a way that readers can easily apply in real life. Leaders and managers of organizations, professional negotiators, salespeople, customer service professionals, parents, teachers, and people simply seeking to improve their personal relationships with others will find this book helpful. The recommendations and checklists in the appendix are particularly helpful. For students enrolled in a course on negotiation and/or persuasion, this book should be required reading."